Mount Tabor, rising dome-like from the Plain of Jezreel, is the mountain where Christian tradition places the Transfiguration of Jesus. Scholars disagree on whether Mount Tabor was the scene of that event (described in Matthew 17:1-9; Mark 9: 2-8 and Luke 9:28-36). However, it has throughout history been a place of mystique and atmosphere, where humanity has sought contact with the divine. Its unique contours — variously described as “breast-shaped”, “hump-backed” and “resembling an upside down tea cup” — captured the imagination of ancient peoples who attached to it supernatural qualities. Mount Tabor stands some 420 metres above the plain in lower Galilee, 7km east of Nazareth. It held a strategic position at the junction of trade routes. Many battles have been fought at its foot. 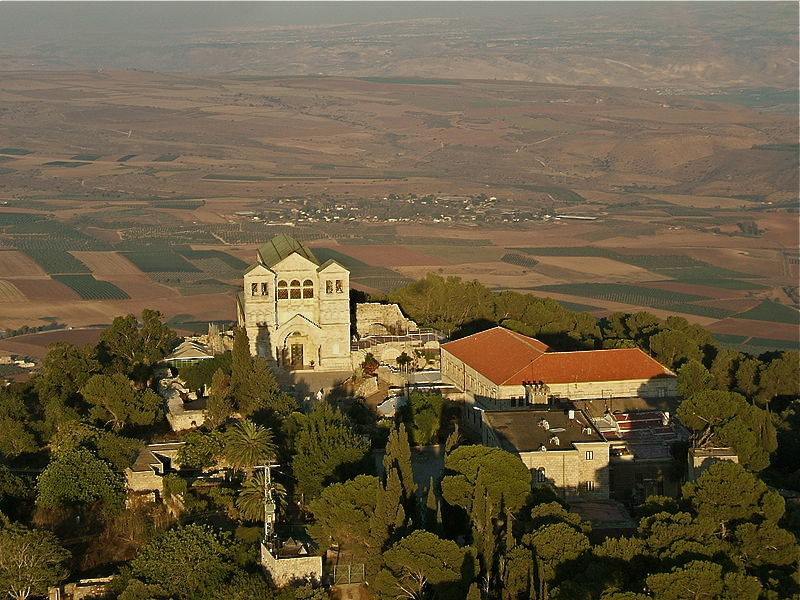 In the Old Testament, Mount Tabor is described as a sacred mountain and a place for worship. It is not mentioned by name in the New Testament. The Gospel accounts of the Transfiguration — a momentous event in which Peter, James and John were introduced to the divine incarnation of Christ, the God-Man — do not specify the place. They simply say it was a “high mountain” in Galilee. Christian tradition in the early centuries named the mountain as Tabor. This location is cited in early apocryphal writings and was accepted by the Syriac and Byzantine churches. Many biblical scholars now question this tradition. Mount Tabor’s location does not fit well into events before and after the Transfiguration. At the time, a Hasmonean fortress stood on the summit. These scholars see the much higher Mount Hermon as a more likely location. Nevertheless, a succession of churches and a monastery were built on Mount Tabor from the fourth century. After the Crusaders were defeated in the 12th century and the area was taken over by the Turks, the Mamluk sultan Baybars destroyed all the religious buildings on Mount Tabor in 1263. Tabor remained deserted for nearly 400 years until the Franciscans negotiated permission to settle there. Early pilgrims used to climb 4300 steps cut into the rocky slope to reach the summit. These days taxis negotiate a succession of hairpin bends before they suddenly reach the summit. The present Catholic and Greek Orthodox buildings (separated by a wall) were constructed in the late 19th and early 20th centuries. The prominent Catholic Church of the Transfiguration, designed by the Italian architect Antonio Barluzzi, stands among ruins of a Benedictine monastery. A bas-relief of the architect, who designed many of the Holy Land’s churches, is set into a wall on the right of the entrance. Its entrance is flanked by chapels dedicated to Moses and Elijah, who were seen with Jesus during his Transfiguration. 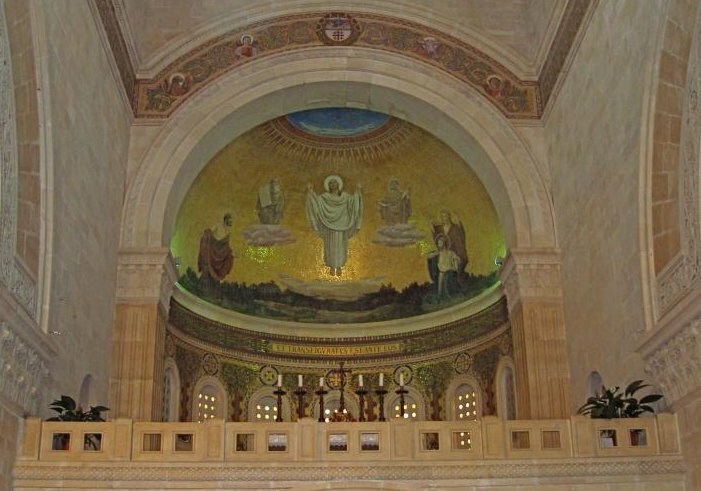 The event itself is depicted above the main altar in the central apse. In the crypt under the church are the altar and fragments of walls of a Byzantine church. There is a tradition that the rock floor of the crypt is where Jesus stood during the Transfiguration. The Greek Orthodox church, often not open to visitors, honours Elijah. It too is built on the ruins of Byzantine and Crusader churches. Mount Tabor’s height affords uninterrupted panoramas. From the balcony of the Franciscan hospice, the view is of the plain of Jezreel, bounded by the Carmel range and the mountains of Samaria. The fertile plain is called “the breadbasket of Israel”, a reminder that one of the meanings of Jezreel is “God sows”. But this plain has often resounded to the clash of battle. On the slopes of Mount Tabor, in the time of the Judges, the prophetess Deborah and her general Barak marshalled their warriors before sweeping down to rout the 900 chariots of Sisera and his Canaanites (Judges 4:4-16). Armies of all the great generals who campaigned in the Middle East have tramped across the plain, from the pharaoh Thutmose III to General Edmund Allenby, and including Alexander the Great and Napoleon. And in the Book of Revelation, it is named as the scene of the battle of Armageddon (also called Harmagedon or Har-Megiddo), in which good will triumph over evil.